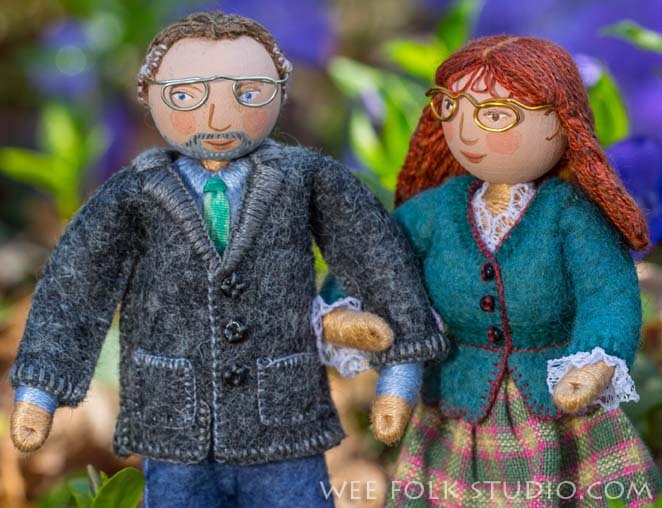 This entry was posted in Dolls, Gift, wedding dolls, Wee Folk by Salley Mavor. Bookmark the permalink. Yes, no gooey icing! It would be OK to stand them up on a hard frosting. Either way, the bottoms of their stand can be protected some how. Talk about a “one-of-a-kind” gift — how very special and so beautifully done. Thanks so much for telling us about some of the new techniques you’re learning and doing. Love the photo with the dolls in the vinca with natural lighting. I simply cannot wait for your new book, I have butterflies just thinking about it and all the new dolls I can make. I adore your work, you are amazing. What a special gift for the bride and groom to treasure. The specs are just amazing, hoping that you will share how they are made. Thanks so much, Jenny. It’s so nice to hear about your excitement, as you anticipate the new book! The glasses are pretty simple to make, just by bending wire, as shown in the photo. I absolutely second everything Jenny says – and I CANNOT wait until the book arrives – I want to make portrait dolls RIGHT NOW! I probably will try, so inspired by these photographs, but knowing all the while that I’ll have your helping hand eventually. I would not call this a new edition of the old book, but Volume Two by the looks of it. We love you immensely for all you share – thankyou-thankyou-thankyou! What a gift you have, and what a great gift it is to be given what such a good mentor offers. I love this couple! I have been an admirer of your work format years now My beau and I plan to marry in the next year or so. We both have had spouses who passed away and long roads behind us. We too feel so lucky to have found each other at this point in our lives. Together, our 4 children are thrilled as well. Would you ever consider making little dolls to look like us? I imagine your life is very full and very busy but they would be little treasures to last a lifetime! I’d surprise everyone with them at the wedding reception! Thanks for asking about making dolls of you and your beau. These personal wedding dolls could become a business, but I don’t want that to happen. At this stage of my career, I prefer to make them as gifts for friends. so special! what a lucky couple…the dolls are so amazing, but I confess it’s their clothing I especially love!! Great work! Yet once again!!! I love their glasses… And wig making? For tiny dolls! In the new book? I cannot wait! My enthusiasm here is driven by my own recent failure at tiny-doll wig-making, so am looking forward to see what you have dreamed up. Absolutely wonderful Sally, your friends are lucky to have you in their lives….this is the real magic of having such a talent as yours..
p.s. congrats to the lucky couple! What a glorious gift for the newlyweds! Not that you need any more work, but how great would it be if you made commissioned “little couples” for weddings, anniversaries, etc. Our 40th anniversary is next year…hint, hint! What a nice gesture for a nice couple!!! Heirlooms!!!!! I just love making your little dolls but I have always had a problem with the hair, never quite figured out how to do it. All my dolls therefore have hats of one kind or another, so excited that you will be sharing that with us in your new book. Thanks. What a wonderful way to honor a friend! You just gave me an idea of what to make for my sister who is getting married soon! I was curious, about how tall are these and what diameter bead did you use for the head? Oh, I hope you make some for your sister, Kathryn. they are about 4″ tall and have 20 mm diameter bead heads. Felt Wee Folk has directions for that size doll.